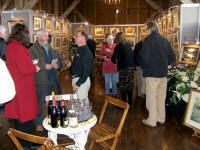 Faced with an appalling November weather forecast and the continuing financial gloom of the country the artist Andrew Dandridge proceeded to hold his 2009 One Man Exhibition at the popular Walton’s Oak Barn at the English Wine Centre near Alfriston, East Sussex. This year, being his eighteenth annual exhibition, to mark the occasion he invited Nazaneen Ghaffar, weather presenter with BBC South East, to perform the official opening. The doors were opened at 10.00am sharp and once again a throng of expectant buyers poured in to view the display of over 90 paintings, the result of months of work by the Artist. Braving the elements visitors arrived from all over the country and the stage was set for the official opening at mid-day. Nazaneen, looking stunning in her blue dress, arrived and brought a real ray of sunshine to the event. Over the previous two days Andrew and Valerie, his wife and business partner, had arranged a stunning display of paintings within the 300 year old barn. Subjects ranged from Sussex Downlands to Cumbrian Fells, winter woods to classic yachts, wild flowers to fast flowing rivers. Daughter Naomi and Valerie's sister Rosemary were an essential part of the team assisting and welcoming visitors. financial situation would put a dampener on things. However, we actually did better than ever with hundreds of visitors and sixty percent of the exhibition being sold. Thank you to all our visitors and to those who purchased paintings. We hope the paintings give them much pleasure. It was good to see old friends again and many new faces too. We try hard to reach new audiences and it is great to meet people who have only recently discovered my work." with onsite parking, restaurant and wine shop to add to our visitors experience". Those who were unable to attend the exhibition but would still like to view his work can visit his on-line gallery. More paintings can be seen at the Whibley Galleries in Worthing.